Order for delivery of Fragrant Embracing Pureness Flower Arrangement to your special one. 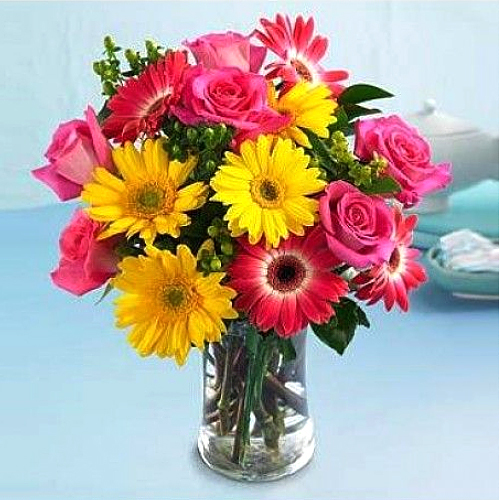 This Bouquet is adorned with Eight Gerberas and Six Pink Roses displayed in a Glass Vase. Flowers Delivery Ahmedabad, Send sweets Gulbarga, Wedding Cake Haveri, Diwali Mithai Phagwara, Send Flowers and Gifts to Cuttack, Online Shop Tiruchirapalli, Flower to Roorkee, New Year Flowers Pali , Fresh Fruits Bikaner, Send Gift Sangli, Dry Fruits to Solapur, Birthday Delivery Ichalkaranji, Sending to Ratnagiri, Flower shop Vadodara, Kozhikhode Online Cake Delivery.